Lance and Tori have already saved the world once from the evil space lizard, Admiral Skink, but this time things are much worse. An asteroid is heading towards Earth and will destroy it in a few days' time. The prime minister, in desperation, has turned to Admiral Skink for help. Admiral Skink is currently being held prisoner at Cottleton Police Station in the form of Pickles the iguana. He promises the prime minister that he will save the planet in return for his freedom. But this is a lie. He secretly builds a wormhole to his own planet, Swerdlix, and escapes. During his escape, a giant thrall-beast finds its way down the wormhole and eats Lance's little sister Sally. This means that it is up to Lance and his friend Tori to travel to Swerdlix; recapture Admiral Skink; work out a way to stop the asteroid; and then find a way of making the thrall-beast sneeze out Sally. Can Lance and Tori do it again? 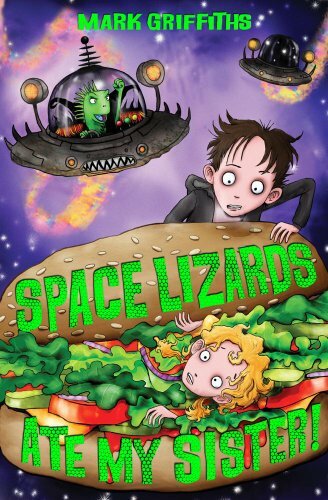 Space Lizards Ate My Sister is the second title in the ‘Space Lizards’ series. This cleverly written, very witty and extremely enjoyable book is a great read for both boys and girls.